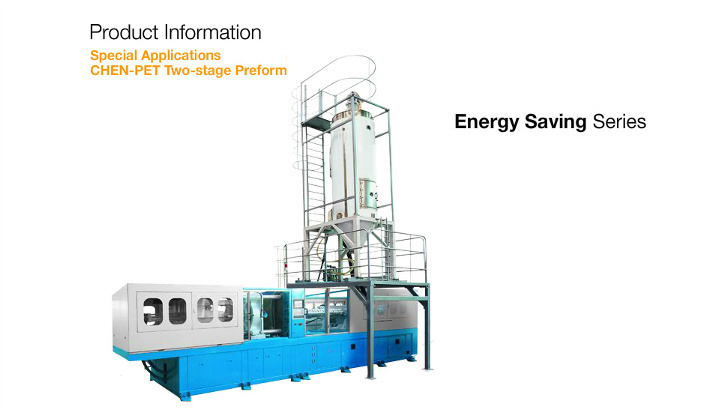 The CHEN-PET is a one-stop solution for two-stage PET preform moulding. This award-winning system combines superior performance, exceptional cost-effectiveness and application flexibility, perfect for the packaging of carbonated drinks, bottled water, edible oils, confectionery, detergents, pharmaceutical products and cosmetics. CHEN-PET seamlessly integrates the injection moulding machine, hot runner mould, robotic take-out plate and pin conveyor into one coherent solution under a single master control. Systems from 4 to 72-cavity are currently available, and producing up to 16,000 PET preforms per hour. The CHEN-PET system integrates an injection moulding machine, hot-runner mould, fast take-out robot, and pin conveyor into one coherent solution under a single master control. 4 to 72-cavity moulds are available. Screw diameter of 75, 83, 93, 110 and 120mm. Producing 1800 to 16000 PET performs per hour. 0.4 seconds robotic take-out time. Second-stage cooling device on the robotic take-out plate with individual cooling tubes and circuits, significantly reduces cycle time. Mould inserts are interchangeable for ultimate production flexibility and easy maintenance. Individual pneumatic actuated valve gates for easy maintenance. Scalable from space-saving, cost-effective machine controllers to large systems with distributed intelligence. A wide range of I/O components and attachment mouldes always allow for the right connections. The high-performance controller from B & R. Its large amount of bandwidth for the input and output of signals from peripherals covers all of the requirements of machine manufacturing, plant manufacturing, and process engineering. Together with I/O system, industrial PCs, and controllers from B & R, automation solutions are created that meet the highest demands. Modern interfaces, together with fieldbus system, networks, and peripheral devices, provide optimal data throughput. Motion Control in CHEN-PET system- Speed and precision to meet the highest demands with built-in technology functions for flexible operation. Safety functions and “Plug & Play” in the power transmission system allow for solutions that will set you in motion.